Today is my last day watching baby Madison so I made her a little room decoration. 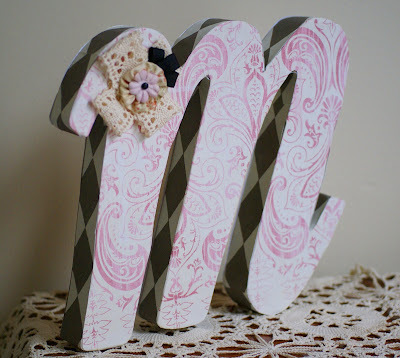 Her crib is black, with pink bedding and decorations, so I made this posh m for a posh little baby! The base is a paper mache letter, covered with scrapbook paper - not hoarded this time! Some crocheted lace, a fabric yo yo (fabric from the stash! 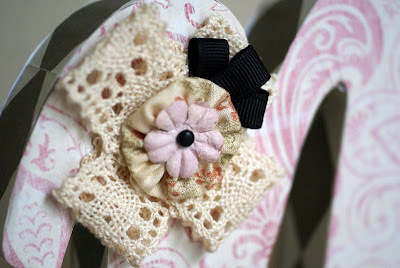 ), some grosgrain ribbon, a paper flower and a brad for the center. I think this is a fun baby gift. Usually I buy books for new babies, but I might add this to my repertoire in addition to the books. A little premade, a little homemade! Very chic!! What a lucky little lady! I really like the way it turned out. May I ask where you found the paper mache letter? I'd love to one for my Grandson, and decorate it like you did yours. It will make a great accent for the nursery! I bought the paper mache letter at Joanns. If you make one, I'd love to see it! Okay, so keep thinking about this and coming back to look at it. Have you thought about an Etsy shop? Keri, that is simply too adorable! What a wonderful gift idea, too -- perfect for a baby, but not something she'll "grow out of" quickly. Thanks for the comments! Madison's mom and dad liked her M! Yes, Tilly, I'm making an etsy shop. I'll let ya know when I've got it ready! Hi, I just found your blog and love it! Just wondering where you got your pretty crochet lace and how wide is it? I've been searching for something like that, either natural color or in a pretty pale pink but haven't had much luck. Thanks for checking out my blog! I can't show you where to buy the lace (unless you live in New England) because it is from a local factory. If you really want it, I can buy it and sell it to you on etsy. If that interests you, you can email me at quaintandquirky at gmail.com. It's about 1 inch wide. I can take better pictures if you would like! Hope that helps!